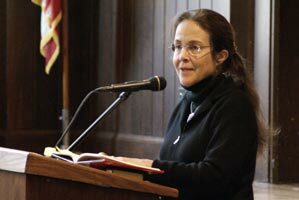 On Wednesday, December 3, 2008, Hathaway Brown School welcomed world-renowned poet Naomi Shahib Nye to speak to Upper School students and local alumnae in Ahuja Auditorium. A self-described "wandering poet," Nye is the writer and editor of more than 20 volumes, including "19 Varieties of Gazelle: Poems of The Middle East" and "You & Yours." Her work has been critically acclaimed and has earned numerous awards. Nye's visit to HB was sponsored by the School's Osborne Writing Center, in partnership with The LIT, a Cleveland league of writers and poets. Nye also hosted a public reading and signing at The LIT's offices, 2570 Superior Avenue, Suite 103, Cleveland.